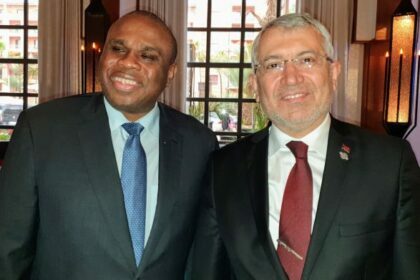 Prof. Benedict Oramah, President of the African Export-Import Bank (Afreximbank), on 5 April 2019 in Marrakesh, Moroco, met with Adnan Yıldırım, Chief Executive Officer (CEO) of the Export Credit Bank of Turkey (Turk Eximbank), to explore opportunities for collaboration between the two institutions. Speaking during the meeting, Prof. Oramah said that Afreximbank was seeing a rising pipeline of Turkish transactions which reflected the growing Africa-Turkey trade relations. He explained that enhanced collaboration between the Bank and Turk Eximbank would make it easier for Afreximbank to facilitate transactions originating from Turkish companies. Prof. Oramah expressed Afreximbank’s readiness to work with Turk Eximbank on business transactions, including the sharing of risks. Responding, Mr. Yıldırım said that Turk Eximbank had been keen to understand the role and operations of Afreximbank and pledged to work to strengthen collaboration between the institutions.